Factor models are changing the way investment managers construct portfolios and analyze portfolio risk. Many firms have turned to a factor-based approach because it removes the artificial constraints of asset class definitions, helping managers focus on risk drivers across their entire portfolio. This increases flexibility when making de-risking and hedging choices. By constructing portfolios based on risk factors instead of asset classes, managers can potentially build more efficient portfolios that require less risk to achieve competitive returns. 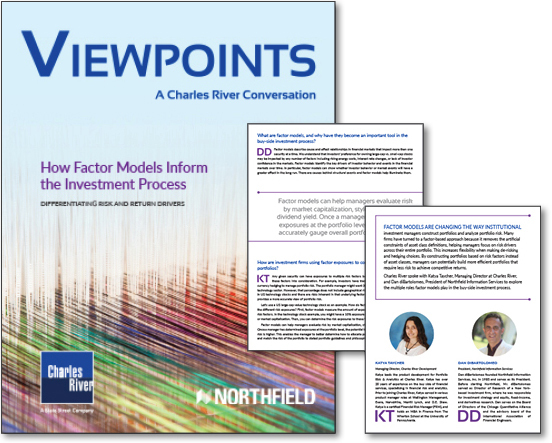 Charles River spoke with Katya Taycher, Managing Director at Charles River, and Dan diBartolomeo, President of Northfield Information Services to explore the multiple roles factor models play in the buy-side investment process. Watch the original recording of this webinar.